After months of thinking about my political future, I am announcing today that I have decided not to run for re-election in 2012. As many of you can imagine, it was a very difficult decision for me. However, I feel that the end of this Congress is the right time for me to step aside. It has been a great honor and privilege to serve the people of Hawaii. 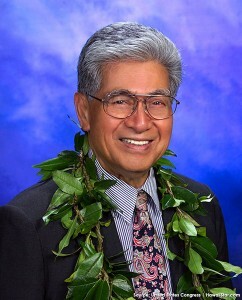 In 2006, the people of Hawaii gave me an opportunity to continue my service in the United States Senate and I fully intend to serve the last two years of my term in office. At the end of this term, I will have served almost 22 years in the United States Senate and, prior to that, more than 13 years in the United States House of Representatives. I am proud of my accomplishments and my incredible staff in Washington, D.C. and Hawaii. They have exemplified the true meaning of being a public servant. They have worked tirelessly and without their dedication and loyalty, I could not have accomplished all that I did. Millie and I will return to Hawaii at the end of this Congress and spend time with our children, grandchildren and great grandchildren. I would also like to spend time documenting my life and career, and serving as a mentor to future political leaders. I have always strived to serve the people with much love and aloha, never forgetting my humble beginnings, and it is my hope that they, too, will continue this tradition. We must never forget that we, as political leaders, work for the people of Hawaii and not the special interests. I will always cherish the time I spent working in Washington, D.C., and extend my heartfelt thanks to the people of Hawaii for their confidence in me. I would like to thank my family, my staff and my friends for their unwavering support. I would like to especially thank my wife, Millie, for her continuous support and encouragement. I could not have done it without her. Finally, I would like to thank Senator Dan Inouye. I will forever be grateful for his friendship and steadfast support.